Justice Smith as Ezekiel ("Zeke") "Books" Figuero: A smart, resourceful teen, brimming with untapped talent and unrequited love, and determined to make his mark in the world. He is in love with Mylene, but her desire to leave the Bronx hinders their relationship. Shameik Moore as Curtis "Shaolin Fantastic": A child of the streets; thrill-seeking, unpredictable, and eccentric, but above all, enigmatic. He is distrustful of Mylene and sees her as a distraction to Ezekiel. Herizen F. Guardiola as Mylene Cruz: A tenacious girl with an incredible voice who dreams of becoming a disco star, a dream that is far outside the realm of her fiercely religious background. She loves Ezekiel, but fears that he won't ever leave the Bronx. Skylan Brooks as Ronald "Ra-Ra" Kipling: A loyal, respected, and protective friend and brother with his head screwed on tight; he's the voice of reason beyond his years. Tremaine Brown Jr. as Miles "Boo-Boo" Kipling: A mechanically minded kid who is an irrepressible 40-year-old in a 14-year-old's body. Yahya Abdul-Mateen II as Clarence "Cadillac" Caldwell: A "fly gangster", prince of the disco world, and son of the owner of the most notorious after-hours night spot in the Bronx. Jimmy Smits as Francisco "Papa Fuerte" Cruz: A South Bronx political boss who delivers services to his constituents that the city has failed to provide, such as jobs, housing, and healthcare. Jaden Smith as Marcus "Dizzee" Kipling : The most artistically minded of the Kipling brothers, Dizzee is a graffiti artist who tags as Rumi 411. 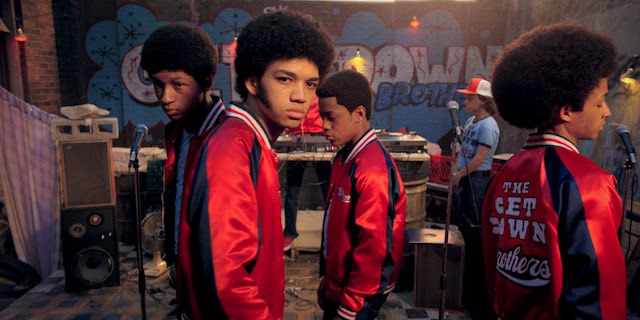 The official soundtrack of The Get Down includes original songs from the series, cover versions and several songs from the 1960s and 1970s, with a principal focus on disco, R&B, funk, and soul. Likewise the TV series, it was released in two parts. 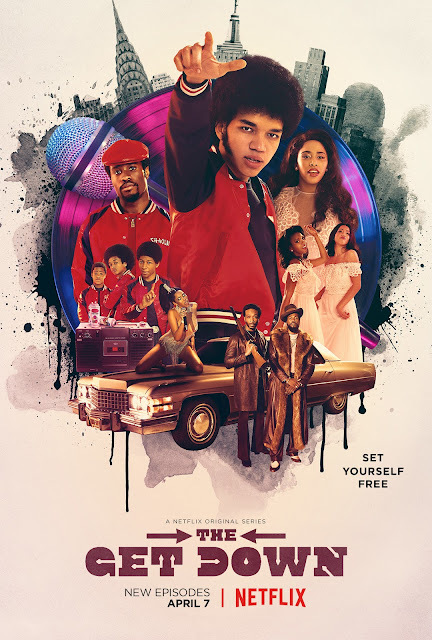 The Get Down (Original Soundtrack from the Netflix Original Series) is the official soundtrack for the first part of The Get Down featuring various artists, released by RCA Records on August 12, 2016. The Get Down: Part II (Original Soundtrack from the Netflix Original Series) is the official soundtrack for the second part of The Get Down featuring various artists, released by RCA Records on April 21, 2017. The Get Down (Score Soundtrack from the Netflix Original Series) is the official score for both the first and the second part of The Get Down featuring original orchestral music and vocal performances, released by RCA Records on September 8, 2017. The score of the series was composed by Elliott Wheeler. This is a list of non−original songs that are featured in the series but not in the official soundtrack. Episode 1: "Where There Is Ruin, There Is Hope for a Treasure"
Episode 2: "Seek Those Who Fan Your Flames"
Episode 3: "Darkness Is Your Candle"
Episode 4: "Forget Safety, Be Notorious"
Episode 5: "You Have Wings, Learn to Fly"
Episode 6: "Raise Your Words, Not Your Voice"
Episode 7: "Unfold Your Own Myth"
"The Get Down (Original Soundtrack from the Netflix Original Series) [Deluxe Version] by Various Artists on Apple Music". Itunes.apple.com. August 12, 2016. Retrieved October 1, 2016. Vanessa Okoth-Obbo (August 16, 2016). "Various Artists: The Get Down OST Album Review". Pitchfork. Retrieved October 1, 2016. Ken Tucker (October 29, 2016). "Hip-Hop Meets Disco On The Electrifying Soundtrack To 'The Get Down'". NPR. Retrieved October 1, 2016. "The Get Down: Part II". Soundrack.net. Retrieved April 17, 2017. "Hear the Songs From The Get Down You Won't Find on the Soundtrack". Time. August 15, 2016. Retrieved April 17, 2017. Moore, Kasey (August 10, 2016). "The Get Down Part 2 Soundtrack (Complete Song Listing)". Whats-on-netflix.com. Retrieved April 17, 2017.